These Holllyhocks are amazing when you see them together. 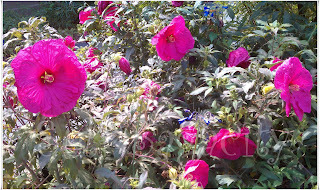 At first glance they looked like Poppy because of the ribbed paper-like petals. But when looking at the middle I thought it could be Hibiscus. However, where I drew the conclusion was the leaves. 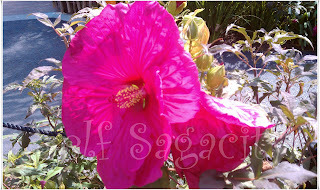 Hibiscus leaves are not spears or maple-like, they are more glossy and smaller. They are so gorgeous, and have the same effects on me as the Outer Banks vacation rental. They are a lot of fun to look at and bring me immediate Happiness. 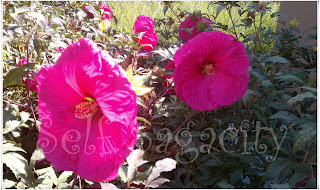 They are gorgeous, I've never seen this amazing color on hollyhocks. They are so beautiful and so perfectly pink. I'm doing a pink flower too! Glorious color and great photographs, Amanda. The crocs I had to wear to see Rufus Wainright at Davies Symphony Hall last night are the same color! My feet are still swollen from all the IVs I had during hospitalization. I thought they were poppies. The color jumps out and is so rich and vibrant. Those petals look paper thin. What great captures. they are so vibrant and beautiful, makes my heart beat fast, i can just imagine it would be such a great cardio work-out with flowers like these on the trail, that's why i so miss spring now. They are gorgeous and the flowers are so big! They are really vibrant - shocking pink I would say. 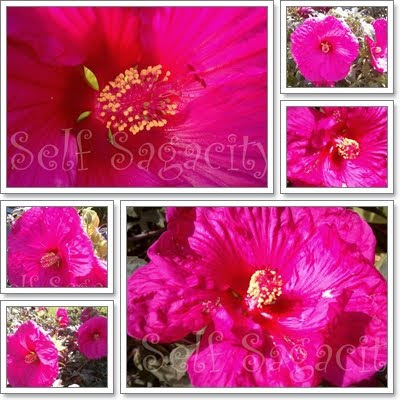 I've bought hollyhock seeds to grown next year in the garden. Wow, talk about vivid color!!! Beautiful. Gorgeous shots, and vibrant pink colors. I love the heart of the flower most.. They are so beautiful... thanks for sharing!!! That's so joyful to see on a Monday morning ! 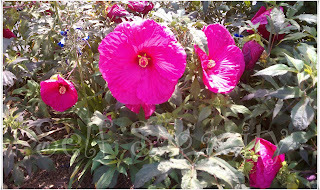 Gorgeous hollyhocks, I don't think I have ever seen them in such a vibrant pink before. Love your last macro shot. How nice to have so much color in your garden. Thank you for sharing your lovely flowers with us. These are just gorgeous- what a colour!! 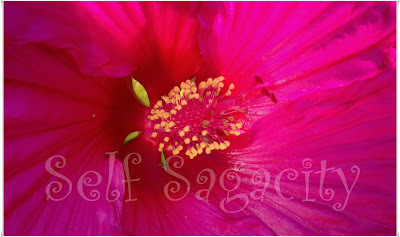 @Maia It was an eye feast, a field of blooming fuchsia hollyhocks.